Dr. King got a C in public speaking at seminary school. King is to date the youngest male to win a Nobel Peace Prize, winning it in 1964 at the age of 35 (at the time he was the youngest overall for the Peace Prize). The youngest ever to win the Peace prize today is Tawakkol Karman of Yemen who was just 32 when she won the prize in 2011. 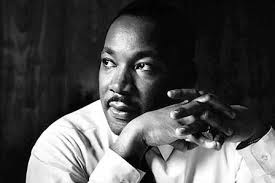 His father, Michael King, Sr., changed their names to Martin Luther King Sr. and Jr. when Martin Jr. was about five. King Jr.’s autopsy revealed that stress had taken a major toll on his body. Despite being just 39 at the time of his death, one of the doctors noted that he had “the heart of a 60 year old”. He was the first African-American to be named Time magazine's Man of the Year. It wasn’t until the year 2000 that all 50 states officially observed Martin Luther King Jr. Day. The last states to join up where Arizona in 1992, New Hampshire in 1999, and Utah in 2000. The holiday itself was originally signed into federal law by President Ronald Reagan in 1983, with the first MLK holiday on January 20, 1986. King Jr. skipped two grades in high school, 9th and 11th, and entered college (Moorehouse College) at the tender age of 15 in 1944. By 19, he received a bachelor’s degree in sociology. Today over 700 streets in the Unites States are named after Martin Luther King Jr., with one such street in almost every major city. This is not even counting the amazing number of buildings, schools, and the like named after him. While at Crozer Theological Seminary, Dr. King was introduced to the teachings and philosophies of Mohandas Gandhi. King won a Grammy and was awarded a Congressional Gold Medal and a Medal of Freedom. The Medal of Freedom and the Gold Medal make sense, but how on Earth did he win a Grammy, you say? He won it in 1971 for Best Spoken Word Album for “Why I Oppose the War in Vietnam”. Author of six books published from 1958 through 1968, works on American race relations and collections of his sermons and lectures. His mother, Alberta Williams King, was also murdered. She was killed while attending church in Atlanta in 1974 by a 23 year old man, Marcus Wayne Chenault, who believed “all Christians are my enemies”. He shot and killed her while she was playing organ at the church. His honeymoon was spent at a funeral parlor… not because someone died, simply because a friend owned the parlor and offered to let him use it for his honeymoon.